Rats and mice can be found in and around every city, town, and farm in the country. It is a conservative estimate that there is one rat for every person living in Australia. Rodents have followed humans to almost all parts of the world. They have no respect for social class; they are equal-opportunity pests. The first pest rodents introduced arrived in Australia with the first settlers and convict ships back in the late 1700’s and early 1800’s. Rats and mice are so closely linked to humans that they are called domestic rodents. Humans supply their three basic needs: food, shelter, and water. Rodents are a threat to health, and they interfere with our economic and physical well-being. They are destructive pests and serious safety hazards. They start fires by gnawing on electric cables. The next time you hear the phrase “fire of unknown origin,” think about rats and mice. They eat large amounts of food and they contaminate even more with their urine, faeces, and hair. At least 20 percent of the world’s food is eaten or contaminated by rats and mice each year, so food spoilage is a big issue. Worse, they spread disease to humans and other animals through their bite, by transporting fleas, lice, mites, and ticks, and by leaving their droppings in food and other materials that humans contact. Rodents are vectors for bubonic plague, rat-bite fever, leptospirosis, hantavirus, trichinosis, infectious jaundice, rat-mite dermatitis, salmonellosis, pulmonary fever, and typhus. Mice have also been linked to asthma. As gnawing and burrowing animals, rodents inflict serious damage to our structures, equipment, furniture, utilities, and transportation vehicles. Rodents can be found in homes, supermarkets, restaurants, livestock pens, and farm fields. Warehouses, grain mills, elevators, silos, and corncribs are especially vulnerable to rodent infestation. Rodents will eat anything humans or livestock eats. They are mainly active at night; rats are seldom seen during the day except when populations are exceedingly large. Rats and mice can crawl through very small crevices, which make it hard to confine their movement. Even if you can’t see them, you may hear them moving after dark. If your pet paws at a wall or cabinet it may be after a lurking rodent. Cats and dogs are not much of a deterrent to rodents, however. Usually, the first clue of a serious rodent problem is their droppings on the kitchen counter, in kitchen drawers, cabinets, or the pantry. When one dwelling is infested, it’s likely the immediate neighborhood is, too. That’s why rodents are so difficult for one homeowner to control. Rodents are a community problem. Effective control necessitates that all homeowners in a community work together to eliminate sources of food, water, and shelter. Rodents are persistent in their efforts to invade the home, but you can deal with them effectively if you know their capabilities. The house mouse (Mus musculus) is by far the most common mammal on earth. Native to central Asia, the mouse arrived in Australia with the first European settlers. Mice can now be found all across this land. The adult mouse has a small slender body weighing about 20 grams. They leave droppings or faeces about 3-4 mm long. The mouse is very adaptable. It’s an excellent swimmer, runner, climber, and jumper. It can jump as high as 30 cm. Mice have excellent senses of smell, taste, and touch. While they have poor eyesight, mice have good peripheral vision that allows them to detect movement. Outdoors, mice nest in weeds, rubbish, cracks in rocks or walls, or they will construct a network of tunnels below the ground, with chambers for nests and storage, and several exits. Each autumn, the onset of cold weather causes mice to search for food and shelter. Mice are curious, and will enter any hole or crack as small as 6 mm. If they like what they find inside better than what they had outside, you will have a mouse problem. Mice will nest in any hidden area near a source of food. Their nests are constructed of rags or paper, lined with finely shredded material, and look like a loosely woven ball 100-150 mm in diameter. If food is available, a mouse will normally travel no more than 3-15 m from their nest. Mice are territorial, and will constantly explore to learn more about their surroundings. They memorise pathways, obstacles, food, water, shelter, and other elements in their habitat. They are quick to detect new objects in their environment, and they are more curious than fearful of anything new. Because of their poor eyesight, mice navigate using their whiskers, usually traveling along a wall or other object. If you don’t move, a mouse can’t see you. They will explore when they think they’re alone, usually at night, but also at any other time when they don’t detect movement. People usually see mice only when they have been sitting stock-still, such as when reading or watching television. Unlike rats, the fact that you have seen a mouse does not necessarily mean they have a high population density. Newborn mice have no fur and are blind. But they grow rapidly. In 2-3 weeks they are covered with hair and their eyes and ears are open. At 3 weeks, pups begin making short excursions from the nest and start eating solid food. It’s easy to see why mouse populations can grow exponentially under the right conditions. Fortunately, breeding slows markedly as mouse populations increase. While they will drink water when it’s available, mice can live in a dry habitat, getting all the water they need from the food they eat. In the wild, mice eat seeds, roots, leaves and stems, beetle larvae, caterpillars, cockroaches, and carrion, but they prefer seeds and grain. Although mice can live on crumbs, typically they eat 3 grams of food per day (10-15 percent of their body weight), or about 4 kg per year. When human food is available, those foods high in fat, protein, or sugar are often eaten in preference to seeds and grain. Some of their favorite human foods include bacon, chocolate, butter, and nuts. Mice are naturally curious, and do not hesitate to sample new foods. They will even eat glue or soap if the soap contains animal fat. Mice nibble whatever food is available, eating small portions to find what they like best. In this manner, mice destroy much more food than they eat. In a year, one mouse will produce approximately 18,000 faecal droppings. They also store food, which can lead to insect infestations. Though it is not their preference, mice will live in freezers feeding only on frozen food. This usually occurs in large commercial operations that have walk-in coolers. The Norway rat (Rattus norvegicus) is strong, very aggressive, and able to adapt to cold climates. Rats are 30-45 cm long, and weigh up to 450 gms. Rat muzzles are blunt, and their bodies look thick and heavy. They have small eyes, naked ears, and coarse fur. Rat tails are 15-20 cms long, scaly, and nearly naked. They have brown to dark grey fur, with scattered black hairs, and are gray, grayish brown or dirty white underneath. A rat will shed over 500,000 body hairs each year. Left untouched, a rat’s incisor teeth would grow 10 cm in a year. So rats must chew continuously to wear down their incisors. Rats will chew on wood, aluminum siding, wallboard, plaster, paneling, frozen ground, concrete … anything but glass and most metals. Their life expectancy is 9-12 months, although some rats have lived as long as 3 years. They are good swimmers, jumpers, and climbers, and they have keen senses of hearing, smell, taste, and touch. They are largely nocturnal, leaving their nests to forage at dusk. Because they are so adept at hiding and scurrying, rats can exist in large numbers unknown to their human neighbors. Unlike the mouse, rats are fearful of anything new. Even so, they quickly adapt to new places to live, new routines, new places to eat, and new kinds of food. People see rats more often from September to November through June (spring breeding), and again in April and May (autumn) as the season changes. But rats are active year-round. Outdoors, rats burrow in earth banks, along walls, under rubbish or concrete slabs, but they are always located close to sources of food and water. Rats follow the same routes as they make their rounds foraging for food each night, so they leave obvious runways in the grass. Rats often travel under objects like bales, planks, granaries, and machinery to conceal their movement. A rat will normally travel no more than 50 m from its nest, but at harvest time rats will travel much further to forage for corn, wheat or beans left in farm fields. or through a gap between a window and its frame. Rats will make holes in walls or floors soon after invasion. Rat holes are circular, averaging 40-70 mm in diameter, and are usually just inches off the floor. Holes in floors are generally close to walls. Rats leave behind a distinctive musk odour, particularly if they are confined to a small space. Like the mouse, rats establish territories and colonies. The dominant male continuously guards his harem of females and aggressively prevents other males from mating. Females actively defend their group against strangers and often nest together. Their nests are constructed from leaves, paper, rags, twigs, or anything else they can find. Rats are nocturnal, but in areas having large rat populations some low-ranked rats will forage during the day, because other rats have denied them access to food at night. Rats are also profoundly prolific. If food and shelter are adequate, rats will breed throughout the year, although fewer litters are produced in winter. Breeding occurs mostly in the spring and autumn. Females often mate within 18 hours of giving birth. Rats continue to breed until 18-24 months of age. Newborn rats have no fur and are blind. But they grow rapidly. In 2-3 weeks their eyes and ears are open. It’s easy to see why rat populations can grow exponentially. Under ideal conditions, a pair of rats could produce 15,000 offspring in one year. Fortunately, breeding slows markedly as populations increase. Rats have voracious appetites. A rat can eat a third of its body weight each day. The rat is a true omnivore. It will eat anything, including soap, leather, furs, candy, milk, meat, vegetables, poultry, eggs, grain, seeds, fruit, nuts, snails, and other rodents. Rats will catch fish, and they readily eat carrion. Near homes, rats thrive on pet food, birdseed, grass seed, garbage, dog feces, and the uneaten or spoiled food we discard. While rats will eat nearly anything, they prefer grain, livestock feed, and meat. Unlike the mouse, which nibbles a little at a time, rats will fill up at one sitting if possible. Rats will hoard and cache food, which can result in insect infestations. Like mice, rats will live in freezers, feeding only on frozen food. Rats eat so much that one rat can leave behind 25,000 droppings per year. The rat’s main constraint is that it cannot go long without water unless its diet supplies enough. Rats need up to 30 mls of water every day. The number and behavior of rats change throughout the year. Many rats die during winter, as outdoor foods become hard to find. Breeding in winter is comparatively low, so rat populations are at their lowest. A mild winter means fewer rats will die of natural causes, so more can be expected in the spring. But if rats are controlled in winter, fewer will be available to resume the breeding cycle in spring. Heavy breeding begins in September when the weather turns. Spring rains spur vegetation which provides cover and additional food. So rats are more abundant in late spring. Young rats have to seek food and new nests. In summer, food and vegetation are abundant, so rats continue breeding. Breeding peaks in early May as temperatures begin to fall. Sources of food and shelter start to diminish in autumn, so rats look for shelter inside buildings and homes – especially wall voids and roof spaces. Getting rid of rats is difficult. Capturing or poisoning a few rats in the neighborhood makes little impact. To defeat them, a community has to cooperate in capturing or killing them, at the same time starving them, denying them shelter, and cutting off their sources of water. Denied a source of food, rats will turn to killing and eating each other, which further reduces the infestation. Droppings – Usually the first clue of a serious rodent problem is their droppings on the kitchen counter, in kitchen drawers and cabinets, or in the pantry. Look for mouse droppings in utility closets, roof voids, garages, sub-floors and basements. Mouse droppings are smooth with pointed ends, and are 3-5 mm long. Rat droppings are pellet-shaped, blunt at both ends, about the size of an olive pit, and shiny black. Roof rat faeces are approximately 12 mm long and Norway rat faeces about 18 mm long and soon fade to gray-white. Droppings are randomly scattered, but normally close to rodent runways, feeding areas, or near shelter. Tracks – Rodent tracks can be observed in mud, dust or bare dirt. Often, rodent tails also leave a mark. In the house, mouse tracks can be seen on dusty surfaces. You can also check for mouse tracks by dusting suspected areas with a light coating of unscented talcum powder or chalk dust. Wait a day and then shine a flashlight across the area. If there are small tracks in the powder, mice have been there. Gnawing – Rats must chew continuously to wear down their incisor teeth. Look for holes in walls or ceilings, and trails in sub-floors, behind or under cupboards, counters, bathtubs, shower stalls, or near hot-water heaters, ducted-heating units or boilers. Burrows – Burrows can be found along ditches, walls, or fences, and under buildings, rubbish, low vegetation, woodpiles or concrete slabs. Runways – Rats follow the same routes as they make their rounds foraging for food each night. In doing so, they leave 50 mm wide runways in the dirt or grass, usually next to buildings or fences. Grease marks – Greasy rub marks are caused by a rat’s oily fur repeatedly coming in contact with walls or entrance holes. Urine stains – Urine stains are more easily observable under a black light. Nests – Mouse nests can be found in utility closets, roof voids, garages, and basements. They are usually made of cloth or shredded paper, lined with finely shredded material. Rat nests look like a loosely woven ball 10-15 cm in diameter. Partially eaten food – Mice leave behind partially eaten food. Although rats eat most of the food they find, they do leave telltale signs, like shells or other inedibles. Live or dead rodents – Normally you will only see mice when you have been sitting stock-still, such as when reading or watching television. Rats are nocturnal, but in areas having large rat populations some low-ranked rats will forage during the day, because they have been denied access to food at night. If you see rats during the day, it is a sign of a substantial infestation. Sounds – While you may not be able to see them, you can probably hear rodents moving after dark. If your pet paws at a wall or cabinet it may be trying to get at a lurking rodent. Odours – Often you can smell rodent urine or their musky odour, especially in a poorly ventilated room. The best way to control rodents is to keep them out of the building in the first place. Since rodents like to hide in vegetation, your first line of defence is to trim the vegetation close to the building. Clean gardens and building surrounds deny rodents the food and shelter they need for breeding, and they restrict a young rodent’s ability to move in. Piles of grass clippings or tree trimmings make ideal rodent harbourages, so properly store and dispose of these materials. Try to leave a couple of feet of clear space between your house and any vegetation. Rodents also like to hide under woodpiles; in abandoned cars, appliances, old machinery, and furniture; and under waste bins. So remove and properly dispose of all junk. Store any wood on racks at least 15 cm off the ground, and away from the house exterior. Store rubbish in sealed garbage bins, dump bins, compactor bins or other collection devices. Check your building perimeter annually in late summer or early spring to ensure there are no gaps that could be used for entry. Sealing up of all rodent entry points is critical in efficient rodent control. Remember that a pencil-sized opening is sufficient for mouse entry. Pay special attention to pipes, wiring, conduits, cables, doors, and windows. Even where buried utility piping enters, the foundation must be effectively sealed. At night, have someone shine a light along the interior of your sub-floor crawl space walls while you circle the perimeter of the building on the outside. Potential entrance holes or other flaws you may not be aware of will show up under the light. Close any openings found, using sheet metal, hardware cloth, or wire mesh. Pieces of tin cut from coffee cans make great patches. Caulking will not do the job. Screen necessary openings, like fans and chimneys, with wire mesh. Wire mesh with holes greater than 6 mm won’t work. Replace missing bricks. Fill in any burrows under the foundation with concrete. Attached garages are serious weak points, because garage doors rarely fit as closely as other doors. Once a rodent has made it into an attached garage, the rest of the house is easy pickings. Therefore, to make the garage less attractive, store your recycled rubbish and garbage somewhere else. But if you must store it there, be especially careful to use containers in good condition with tight-fitting lids. Never leave plastic rubbish bags in an attached garage. Again, shine a light along the perimeter of your garage door at night to see if it offers easy entry. Check the doors of attached garages more often than once a year. Windows and exterior doors should fit properly, be weather-stripped, and be kept closed when not in use. There should be no holes in screen doors. Screens are easy to patch. All window and door edges subject to gnawing should be covered with metal. Even water puddles will give rodents all the water they need to drink. So all leaks must be fixed, and all ruts and depressions in ground areas must be drained or filled in. Keep all guttering clean so water doesn’t stand. Make sure your evaporative cooling unit, split system or window air conditioner isn’t creating a puddle of water. Cover swimming pools and spas. Water hoses are notorious for leaking at the connections; so when you’re finished using the hose shut the water off at the tap, rather than at the hose nozzle. Outside food sources that attract rodents include garbage, dog and cat food, dog faeces, birdseed, and fruits or berries that have fallen to the ground. Take away their sources of food outside, and rodents will look for another neighborhood to live. Pick up fruit and vegetables in your yard. A honeycomb can feed hundreds of mice all winter, so carefully remove any beehives in the immediate area. Birds are messy eaters, which is especially helpful to rodents. So quit feeding the birds for the duration of the infestation. If you’re feeding the possums; you’re also feeding rodents. If at all possible, feed your pets indoors. If you must feed your pets outside, remove their food 30 minutes after serving. Otherwise, whatever your pet doesn’t eat, rodents will. Since rats are nocturnal, feed your outdoor pet well before dark. Store your garbage in containers, preferably made of metal, with tight-fitting lids. Never leave plastic rubbish bags outside. Turn compost piles regularly and don’t compost meat, bones, dairy waste, fats, or oils. Remove dog faeces from the garden daily. In commercial and farm buildings, store bulk foods in rodent-proof buildings, rooms, or containers whenever possible. Stack packaged food on pallets with adequate space left around and under stored articles to allow inspection for signs of rats. There should always be enough room for a person to walk between the pallet racking and warehouse wall to carry out an inspection. Never store pallets hard up against the walls or leave unattended for long periods of time. Drain holes in dumpsters should be fitted with a removable hardware-cloth screen, or else plugged after each cleaning. Although cats, dogs, and other predators sometimes kill rats, they do not provide effective rodent control. They just can’t kill rats fast enough. Rats often live among cats and dogs. They use a pet’s food and water, and sometimes even their shelter. trapped rodents can be easily disposed of before becoming an odour hazard, as can happen with poisoning (i.e., rodents dying in inaccessible places around the building). Traps are particularly effective if rodent populations are small. Snap traps, glue boards, and cage traps all work. Most traps can be used over and over. Wood-based snap traps are inexpensive, and available at most hardware stores. 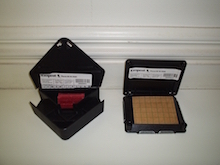 Most snap traps are designed for mice but larger traps designed specifically for rats are available. Purchase enough traps to make your effort short and decisive. Traps need not be baited, just located where rodents will trip across the trigger in their normal course of travel. If you want to bait your traps use a very tiny amount of peanut butter, gumdrops, raw bacon, balogna, or vanilla extract (use a cotton swab to apply vanilla extract). Whatever you use, don’t pile it on. Do so, and you increase the chance for an insect infestation. You also increase the chance that a rodent will find a way to remove the bait without getting caught. You may also kill one rodent but feed several others. All you really want is the food smell. You can also bait with a piece of cotton ball, since rodents like to use it to build nests. Cotton has the advantage of not attracting insects. 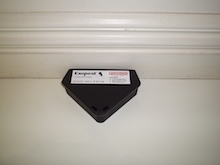 Place the traps wherever you find signs of rodent activity, but preferably near walls. Traps work best when placed at right angles to a wall, with the trigger end touching the wall. This takes advantage of a rodent’s preference for travel along walls. Remember also to keep your traps out of reach of pets and small children. Several traps should be located in suspicious areas. Ideally, they should be moved to different locations each day, and certainly they should be moved if rodents are not being caught. It may be necessary to adjust the trap trigger to ensure easy release when touched by the rodent. Since rats especially are shy of anything new, it may be necessary to leave a trap unset until the bait has been taken at least once, to reduce the chance for trap shyness. Commercial only: Glue boards have a sticky surface that holds any rodent that attempts to cross it. Glue boards have become an integral part of monitoring pests in commercial food production premises. Glue boards are used to monitor and reduce pest populations. Victorian Government Gazette approved the use of glue boards on the 21st June 2011 in Regulation 53 for licensed commercial pest-control companies only to be used in commercial food premises. Glue boards are very effective where large numbers of rodents need to be reduced quickly, or where non-chemical control methods are required. They have become an important part of pest management because they can be used in areas where no other control products are allowed or suitable and because they seem to be environmentally green as they contain no toxic chemicals. Locate glue boards anywhere you would other traps, but remember that glue boards are very sticky that they’ll be a problem for any children, livestock, pets or other non-target wildlife that come into contact with the glue. Auditors of food manufacturers, including export meatworks audited by AQIS (Australian Quarantine Inspection Service) require multiple levels of controls and often restrict the use of rodenticides from sensitive areas where there is potential for contamination. Glue boards are often very suitable in commercial premises to slide under a fridge or cooler where a large snap trap could not fit or is not appropriate. When using glue boards service frequency needs to be almost daily to remove dead bodies and monitor population levels. Also keep in mind that dust will reduce the effectiveness of a glue board. Once caught on a glue board, a mouse will usually die from cardiac arrest. Glue boards will lose their effectiveness over time, so replace them when they are no longer sticky. As with any other trap, move your glue boards to another location if rodents are not being caught. Ultrasonic devices broadcast sound waves above the range of human hearing, but they have limited efficacy because the sound waves produced cannot penetrate solid objects like walls and leave many areas in ‘shadow’. They also quickly lose intensity with distance. Because rodents rapidly become accustomed to repetitive sounds, there is little evidence that sound devices will drive established rats or mice from buildings. Likewise, there is little evidence that magnetic devices or vibrators have any positive effect on rodents. Rodenticides are poisoned baits (normally anticoagulants) and fumigants used mainly by licensed pest-control professionals for rodent control. Since fumigants (methyl bromide, phosphine etc.) are gases highly toxic to humans, livestock, and other animals, they cannot be applied in buildings where occupants could be exposed. Fumigants are only used in Australia by licensed fumigators and the majority of fumigations happen under AQIS (Australian Quarantine Inspection Service) supervision on the waterfront and docks. Fumigation always occurs in a sealed environment over a set exposure period. Rodenticides have a wide variety of active ingredients and come in all shapes and sizes. There are registered rodenticides available on the open market, but they require training and experience to apply safely and effectively. If not properly applied, these pesticides can kill or otherwise endanger children, pets, or other non-target animals that may mistakenly eat or breathe them. We urge you not to use these materials yourself. Hire a licensed pesticide technician well-versed in rodent control. Sometimes rodenticides work too well: they can kill a rodent before it makes it out of the house. In that case you’ll have dead rodents in inconvenient places like attics, wall cavities, crawl spaces, or behind cabinetry … stinking up your home and causing major insect and fly problems. Since rodenticides are pesticides, they also present serious storage and disposal problems. Single-dose and multiple-dose anticoagulants are the two main groups of rodenticides commonly used in rodent control. These reduce the ability of the blood to coagulate and clot, causing internal haemorrhaging and death. The multiple dose poisons cause death to the rodent in 4-8 days of regular feeding, while single-dose cause death in 3-7 days, after only one feed. Multiple dose products include coumatetralyl (Racumin) either paste or powder and warfarin (Ratsak). Feeding must occur continually over several days, so the supply of bait needs to be always available when placing multiple dose anticoagulants. Single dose anticoagulants are the more common chemical control product and include bromadiolone in Bromakil wax blocks, Bromakil drink concentrate, Contrac mouse and rat bait, Contrac blocks and Contrac pellets. Also brodifacoum in Ditrac blocks, Ditrac pellets, Talon wax blocks and Talon pellets. A new single dose second-generation anticoagulant is flocoumafen, marketed as Stratagem. Reasonably priced tamper-proof lockable rodent bait stations have revolutionised rat and mouse control in sensitive environments like schools, kindergartens, hospitals, special-care centres, pharmaceutical manufacturing, and food production facilities. Now the rodent bait can be safely locked away in the bait station and no non-target animals, pets or young children can accidentally be at risk. Tamper-proof stations have also removed bait spillage and possible contamination, whereas previously, open bait trays were easily knocked over creating a potential health risk. Bait acceptance rates have also increased because the rodent feels more secure and protected when in the station feeding. Tamper-proof stations come in all shapes, designs, and sizes; some even look like a common garden rock. and also spray those traps that have caught rodents, as well as the areas where rodents have been active. Wash your hands with soap and hot water after disposing of rodents and rodent droppings, even if you used gloves.